Edie and Andy: THIS WEEKEND SEE ME PRESENT AT STITCHY! That's right! 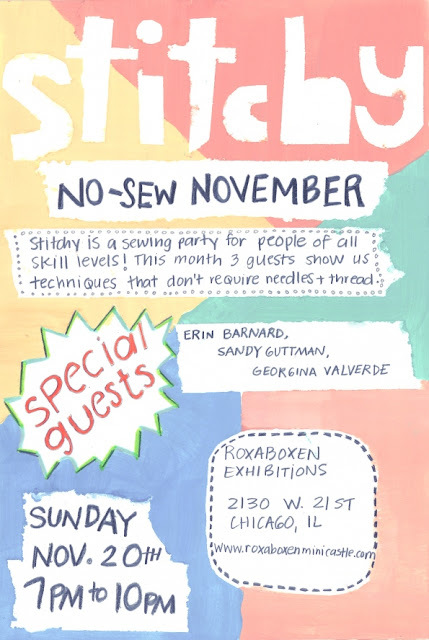 I will be one of the featured presenters at Stitchy this Sunday! This month's theme is No Sew November, and I will be presenting my ever popular Shirt/Skirt - apparently it was a hit and people want to learn how to do it themselves! Additionally, I will be sharing my Tamagotchi and Bjork Swan Dress Halloween costumes - both made with little-to-no sewing! If you're in Chicago and looking to join the coolest sewing circle around, come on by Roxaboxen Exhibitions!